Women´s Saturday Summer Wellness Event! 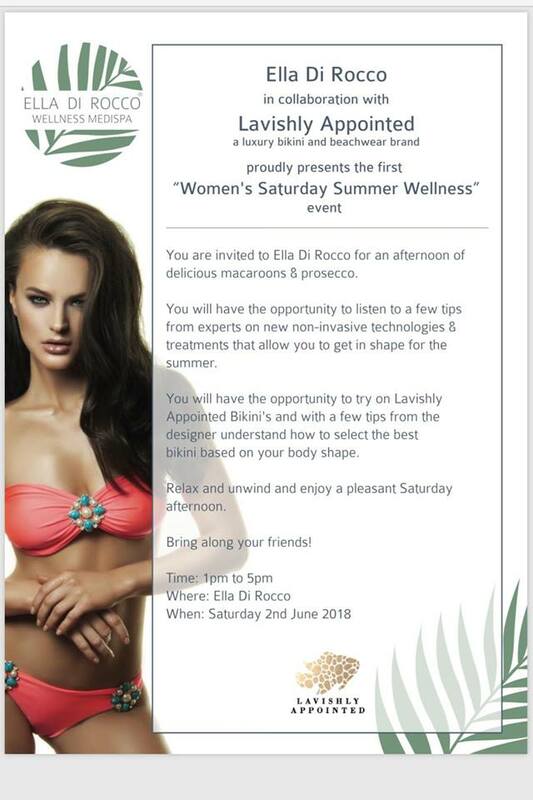 We from Lavishly Appointed invite you to Ella Di Rocco for an afternoon of delicious macaroons & prosecco. You will have the amazing opportunity to listen to a few tips from experts on new non-invasive technologies and treatments that will allow you to get in shape just in time to enjoy a lovely summer. You will have the chance to try on Lavishly Appointed luxury Bikinis, on top you will get a few tips from the designer herself. She will give you the right know-how to find the most flattering bikini for your body shape! Relax and enjoy a girly Saturday afternoon! Can´t wait to see you there!